The big retail chains are already putting autumn and winter fashion on display, regardless of the burning heat outside. We hardly get a chance to enjoy shopping for summer clothes, and they are already gone away. During the summer I design winter clothes, but the fabric stores still haven't received a large variety of winter fabrics, so manufacturing is delayed. The quick season changes in the fashion world are very hard on me as a designer, and they are irrelevant to both the customer and the weather conditions. I have decided to release a new summer model, a tailored shirt dress made of cupro viscose in an earthy brown color. Cupro is a delicate fiber, derived from natural cotton seeds. The fabric is specially processed for flexibility and shine. Clothes made of cupro are airy, with silky look and feel and perfect softness. The dress is sleeveless, knee-length, with an open tailored collar and natural shell buttons down to the waist. 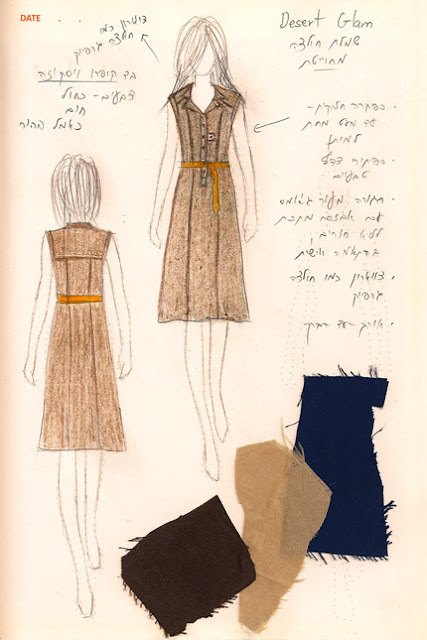 The dress is sold with a mustard-colored suede-leather belt with a metal buckle, to be custom-fitted without holes.